Image courtesy of the Petaluma Pie Co.
Special thanks to Lina and Angelo for supporting the UndocuFund tomorrow! All day long, your purchase at the Petaluma Pie Co. will benefit the UndocuFund. 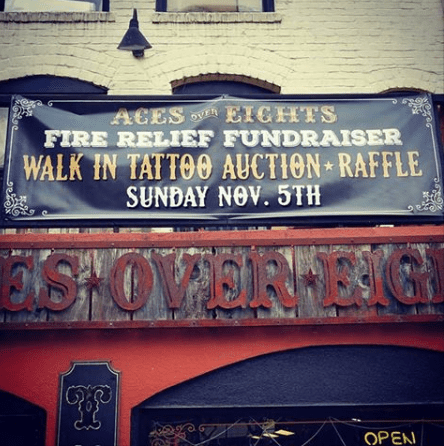 After your pie, head over to the Aces over Eights tattoo parlor and you’ll be benefiting the UndocuFund as well. For more information about the UndocuFund, visit their website. 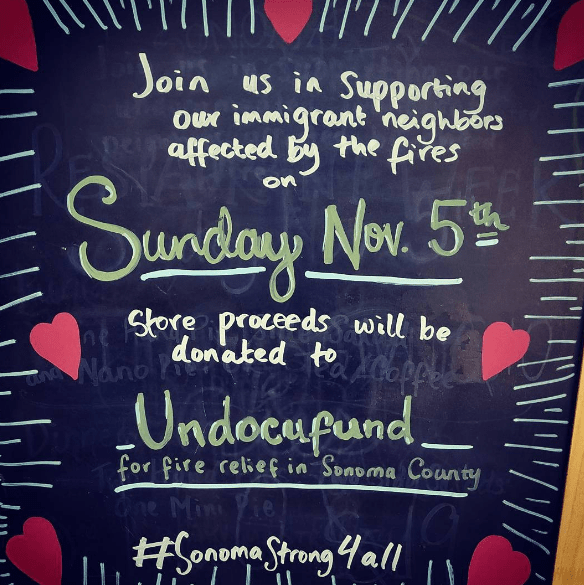 We invite you to eat pie at Petaluma Pie Company and help raise funds for Undocufund: Sonoma County Fire Relief Fund this Sunday. Proceeds from the day at the shop will be donated to Undocufund: For Fire Relief in Sonoma County. An estimated 28,000 undocumented immigrants live and work in Sonoma County. Unlike other victims of the fires that have devastated Sonoma County, undocumented immigrants do not qualify for assistance from the Federal Emergency Management Agency (FEMA). Lack of immigration status, limited English proficiency, and fear of immigration enforcement will also impede their access to disaster-relief services, even when they are eligible. Lack of familiarity or comfort with law enforcement, county departments, and financial institutions present additional barriers. Consequently, the fire victims will face significant challenges in meeting basic needs and rebuilding their lives here in Sonoma County where the cost of living is very high. THE UNDOCUFUND WILL ENSURE THAT UNDOCUMENTED FAMILIES IN SONOMA COUNTY IMPACTED BY THE FIRES WILL HAVE THE SUPPORT AND RESOURCES THEY NEED TO RECOVER AND REBUILD. Image courtesy of Petaluma Pie Co.
By the way, concurrently, Aces over Eight tattoo shop will be having a walk-in-tattoo fundraiser for Redwood Credit Union Fire Relief Fund. It’s a great day to eat pie and get a tattoo to support our communities! You can read more about Lina, Angelo and the Petaluma Pie Co. in Clark Miller’s recent piece in the Argus-Courier. Earlier this year, Angelo and Lina added the much-needed perspective of small-business owners to the conversation about our urgent need for affordable housing in the community, with this piece. Hannah Beausang also wrote about their push for housing in an article for the Argus-Courier.